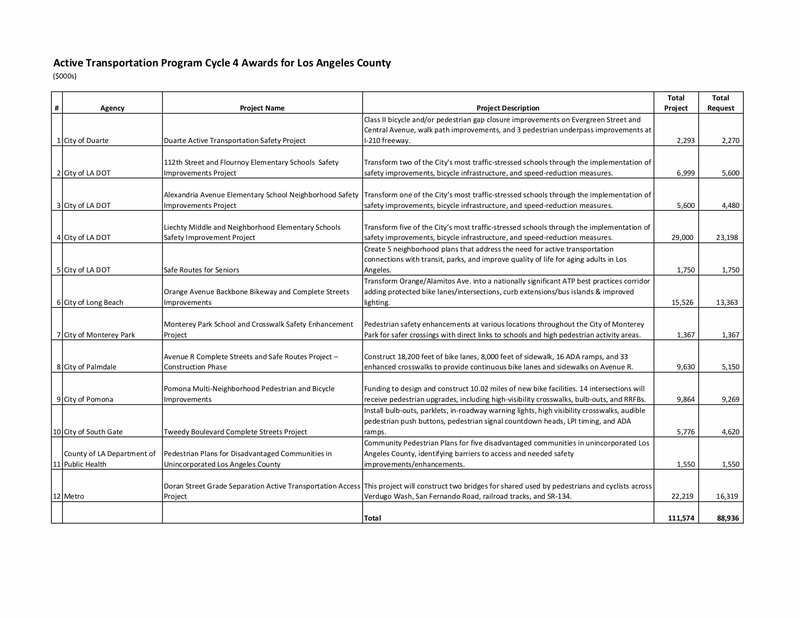 The California Transportation Commission last week awarded $88.9 million in funding for 12 walking, biking and other active transportation projects in Los Angeles County. The $88.9 million is 37 percent of the statewide total — a pretty good haul for our county. •Liechty Middle and Neighborhood Elementary Schools Safety Improvement Project in the city of Los Angeles by LADOT. •Pomona Multi-Neighborhood Pedestrian and Bicycle Improvements. •112th Street and Flournoy Elementary Schools Safety Improvements Project in the city of Los Angeles by LADOT. •Duarte Active Transportation Safety Project. •Safe Routes for Seniors by LADOT. •Orange Avenue Backbone Bikeway and Complete Streets Improvements in the city of Long Beach. •Doran Street Grade Separation Active Transportation Access Project by Metro. •Pedestrian Plans for Disadvantaged Communities in Unincorporated Los Angeles County. •Alexandria Avenue Elementary School Neighborhood Safety Improvements Project in the city of L.A. by LADOT. •Avenue R Complete Streets and Safe Routes Project – Construction Phase in the city of Palmdale. •Tweedy Boulevard Complete Streets Project in the city of South Gate. •Monterey Park School and Crosswalk Safety Enhancement Project in the city of Monterey Park. State law requires 25 percent of ATP funds to be awarded to projects benefitting disadvantaged communities. Los Angeles County is home to 46 percent of the state’s residents who live in those areas and our region has been focusing on projects that will help residents of those areas. Nothing in the SF Valley? That seems completely unfair.